Note: Use French Braider with a friend to create this look. 1. 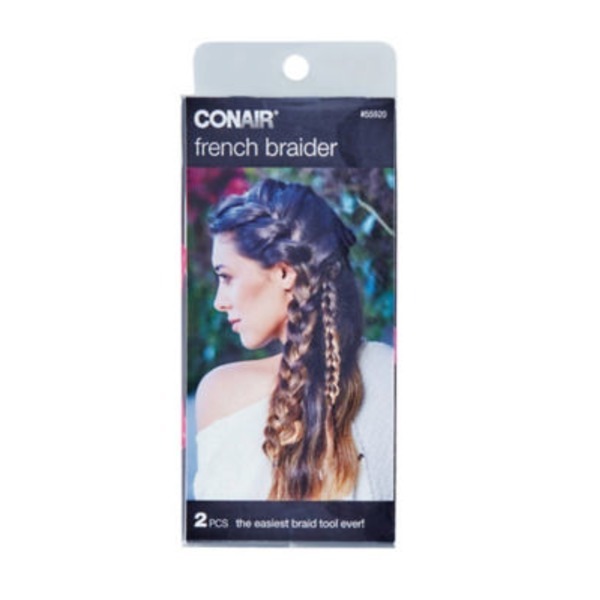 Pick up a small section of the hair and hold the French Braider under the hair where you want the braid to begin. Place one-third of the hair into slot 1. Divide the remaining section into two equal parts and place these parts into slots 3 and 4. 2. Move the hair from slot 4 to slot 2 (slot 4 is now empty). Move hair from slot 3 to slot 4 (slot 3 will now be empty). Move hair from slot 1 to slot 3 (slot 1 is now empty). Move hair from slot 2 to slot 1 (slot 2 is now empty). 3. Move hair from slot 4 to slot 2 (slot 4 will now be empty). Move hair from slot 3 to slot 4 (slot 3 is now empty). Add an additional section of hair to slot 2 (hair from the outside of the tool on the left). Move hair from slot 1 to slot 3 (slot 1 is now empty). Move hair from slot 2 to slot 1 (slot 2 is now empty). Add an additional section of hair to slot 3 (hair from the outside of the tool on the right). 4. This has now started the French braid sequence. Repeat step 3 for the length of your hair and fasten with an elastic.